Dunbar volunteers joined a shoreline search for a missing woman on Wednesday afternoon (September 20). UK Coastguard tasked the crew of the inshore lifeboat (ILB) at 4.30pm to join a search that had begun at 2.30pm. Police and coastguard teams from Dunbar and North Berwick were also searching for the woman who was described as vulnerable and there were fears for her safety. 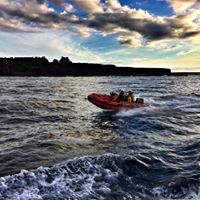 The ILB crew searched the harbour area, then west along the shoreline to Belhaven and onto the River Tyne before heading back to the harbour and commencing a search eastwards to Dunbar golf course. At 6pm, after the search failed to find the woman in question, the Coastguard stood down all teams and the ILB returned to the harbour where it was refuelled and readied for service.